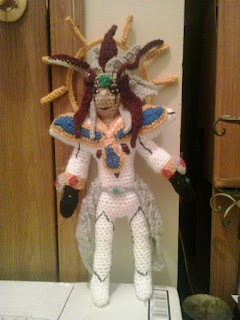 This is next request from a customer of mine on Etsy that is obsessed with Yu-Gi-Oh shows and card game. Aporia was easier than some of the dolls that I have made in the past because it is an adaptation of my male doll that I have used to make characters like Thor, Spiderman, Captain America, and Power Rangers. Worsted weight yarn: White, gold, gray, green, buff, blue, black, greybeard, and burgundy. Finish off. Weave in ends. Embroider red diamonds on SLEEVES. Rds 10-12: sc in each sc around. (8) Change to white after Rd 12. Finish off. Weave in ends. Stuff ARMS firmly. Embroider green jewel on each HAND. Finish off leaving a long tail. Sew SLEEVE JEWELS to SLEEVES. BEGIN STUFFING LEGS FIRMLY. CONTINUE STUFFING LEGS AS YOU GO ALONG. Finish off leaving a long tail. Fold HEEL in half and sew together. Insert cut piece of wooden skewer. Sew HEELS to LEGS. Rd 22: holding marked sc on ARM together with next sc on BODY and working through both thicknesses, sc in next 2 sc, sc in next 12 sc on BODY, holding marked sc on ARM together with next sc on BODY and working through both thicknesses, sc in next 2 sc, sc in next 14 sc on BODY. Rd 25: (sc2tog) 4 times, sc in next 12 sc, (sc2tog) 4 times, sc in next 14 sc. (34) Change to buff. Finish off with a long tail. Add more stuffing to firmly achieve desired shape. Weave tail through sc of Rd 44, pull tightly, and secure. Weave in ends. Using black, embroider leg markings. Finish off leaving a long tail. Sew NOSE to HEAD bunching Rw 1 together. Embroider EYES and MOUTH on APORIA. Finish off leaving a long tail. 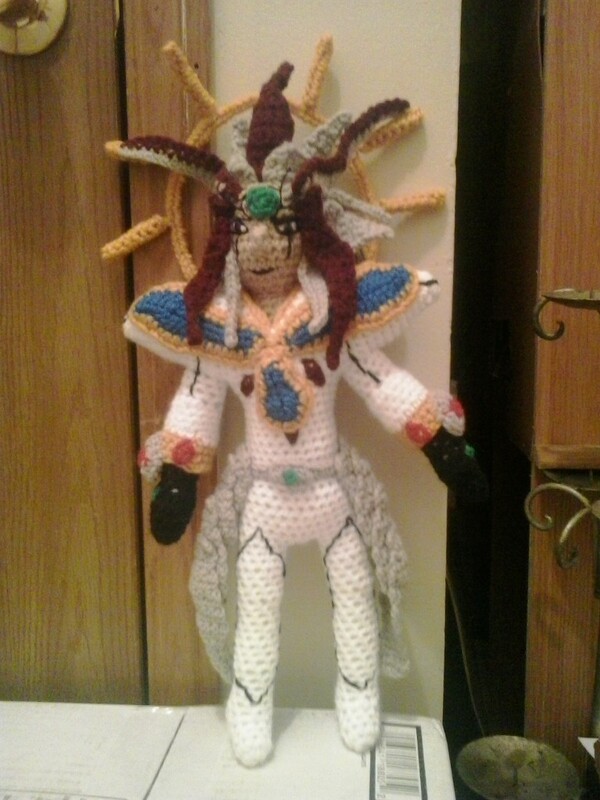 Sew HAIR BODY to head of APORIA. Finish off. Weave in ends. Sew BURGUNDY HAIR POINT to HAIR BODY. Finish off. Weave in ends. Sew GRAY HAIR PIECE 1 to HAIR BODY. Rw 4: Ch 12, slip st in second ch from hook, sc in next 8 ch, hdc in next ch, 2 hdc in next ch, skip next 2 sc, slip st in next sc. Rw 5: Attach burgundy in slip st in Rw 1, sc in side of Rw 2, 2 sc in side of Rw 3, working in sc of Rw 3, sc in next 3 sc, sc in same sc as last slip st of Rw 4, working in sts of Rw 4, sc in next 11 sts, slip st in next slip st. Finish off. Weave in ends. Sew GRAY HAIR PIEC 2 to HAIR BODY. Rw 2: Ch 1, turn; sc in next 7 sc, ch 6, slip st in second ch from hook, sc in next 4 ch, slip st in first sc of Rw 1. Finish off. Weave in ends. Sew GRAY HAIR PIECE to HAIR BODY. Sew first 4 sc of Rw 2 to GRAY HAIR PIECE 2. Finish off leaving a long tail. Sew GRAY HAIR PIECE 4 to HAIR BODY. Finish off leaving a long tail. Sew GRAY SIDEBURNS to HAIR BODY. Finish off. Weave in ends. Sew BURGUNDY SIDEBURNS to head of APORIA. Fringe on pieces of greybeard to HAIR BODY. Finish off leaving a long tail. Sew FOREHEAD JEWEL to head of APORIA. Using size 10 black crochet cotton to create FOREHEAD LASHES. Finish off leaving a long tail. Sew RIGHT SIDE BACK to LEFT SIDE BACK. Rd 1: Attach white in side of Rw 20 of FRONT, ch 1, working in side of Rws, sc in next 4 Rws, sc in same sc as last worked sc of FRONT, sc in next 4 unworked sc of Rd 15, sc in same sc as last sc of BACK, working in side of Rws of BACK, sc in next 10 Rws, sc in same sc as last sc of BACK, sc in next 4 unworked sc of Rd 15, sc in same sc as last of FRONT, working in side of Rws of FRONT, sc in next 4 Rws, slip st in next Rw. Finish off. Rd 2: Attach gold in side of Rw 20 of FRONT, ch 1, sc in next 29 sc, slip st in side of Rw 20 of FRONT. Finish off. Weave in ends. Stuff SHOULDER PADS points firmly. Place SHOULDER PADS on APORIA and sew down adding any stuffing needed to achieve shape. Rd 2: Ch 1, sc in next 10 sc, 2 sc in next 2 sc, sc in next 4 sc, 2 sc in next sc, sc in next 5 sc, 2 sc in next 2 sc, sc in next 9 sc, 2 sc in next sc, slip st in first sc. Finish off leaving a long tail. Sew BLUE SHOULDER PADS JEWELS to SHOULDER PADS. Rd 1: With blue, ch 6, sc in second ch from hook, sc in next 2 ch, (hdc, dc, hdc) in next ch, 3 sc in next ch working around ch, working in free loops of foundation ch, (hdc, dc, hdc) in next ch, sc in next 2 ch, 2 sc in next ch, slip st in first sc changing to gold. Rd 2: Ch 1, sc in next 4 sc, 2 sc in next sc, sc in next 2 sc, 2 sc in next sc, sc in next 2 sc, 2 sc in next sc, sc in next 4 sc, 2 sc in next sc, slip st in first sc. Finish off leaving a long tail. Sew CHEST JEWEL to BODY. Using burgundy, embroider CHEST MARKINGS. Finish off leaving a long tail. Sew BELT BUCKLE to BELT. Using green, embroider jewel in center of BELT BUCKLE. Rw 7: Ch 1, turn; slip st in next 3 sc, 3 sc in next sc, slip st in next sc. Finish off leaving a long tail. Sew HIP BELT PLATES to BELT. Rw 11: Ch 1, turn; sc in next sc, slip st in next 3 sc, sc in next sc. Finish off leaving a long tail. Sew LEG GUARD 1 to HIP BELT PLATES. Finish off leaving a long tail. Sew LEG GUARD 2 to LEG GUARD 1. Finish off leaving a long tail. Sew LEG GUARD 3 to LEG GUARD 2. Rw 9: Ch 3, 2 sc in second ch from hook, sc in next ch, sc in next 2 sc, (sc, slip st) in next sc, ch 3, 2 sc in second ch from hook, sc in next sc, slip st in top of last sc before ch-3. Rw 10: 3 sc in next sc, slip st in next sc. Finish off leaving a long tail. Sew BACK PLATE to BODY. Use floral wire to form ring. Sc over ring. The number of sc will depend on tightness of your sc. Finish off leaving a long tail. Sew Rw 1 to Rw 3. Slip RING ARMS onto chenille stem foundations and glue in place. Sew BACK RING to APORIA. Aporia and Yu-Gi-Oh are copyright Konami and their respective creators. Thor, Spiderman, and Captain America are copyright Marvel Comics and their respective creators.